Beer. As a cultural crutch and a social lubricant, there is no more popular beverage in Australia. Actually, there’s probably no more popular alcoholic beverage around the world in that sense. The difference in regions and tastes is as dramatic across Australia as it is across Europe and the Americas. Sharing stories with locals about their national beers is an easy way to make new friends in a foreign country. And what better way to encourage more social drinking than with an app? Well, let’s crack a keg and talk about Untappd. Launched in 2010, this social drinking app has been growing and functioning for a long time now. And in that time it’s kept to its core promise: discover beer and share what you’re enjoying with friends. Millions of downloads on iTunes and Google Play mean there is a lot of very social beer aficionados out there – all of which works in the user’s favour, because apart from an incredibly extensive list of beers (G has yet to find a beer that isn’t on Untappd) there are reviews, recommendations and location information. The function is simple: type your beer name in, select it from the list, find the location you’re drinking (thanks to Foursquare), give your beer a rating out of five stars (with quarter star increments), and then add a little description if you like! Done before you put your schooner down after the first sip. Add your friends (via Facebook and Twitter if you like, or just by username) and ‘toast’ their check-ins or comment on them too. But after you’ve checked in the app’s algorithm will use your beer’s info and your rating to show you a few recommendations of similar beers you might enjoy. And there’s a reward too. Badges are the reward. These work like most game-based achievement systems. The more you use the app, the more badges you unlock. Check-in five Australian beers? That’s a badge! Five pale ales? That’s a badge! Thirty beers in a month? That’s a badge! Having a beer on a boat? That’s a badge too! The constant updates means there’s no end to the badges, which is a good thing. Untappd (and P+P) always recommend drinking responsibly, but they also encourage you to drink diversely. Variety is the spice of life, and a variety of beers makes for a well-rounded beer baron. 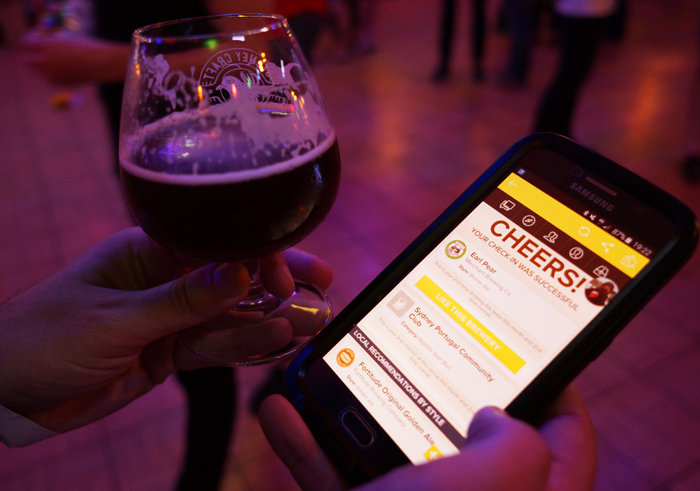 If you’re a beer drinker, you shouldn’t be without this app. There is something in its appeal for everyone. It’s got a very clean and uncomplicated system. It’ll show you some fantastic beers you might have missed out on otherwise. Make some recommendations to friends, or get given some. And collect the most badges in your circle to truly become the beer legend that you wish to be. Rating: five pints out of five.